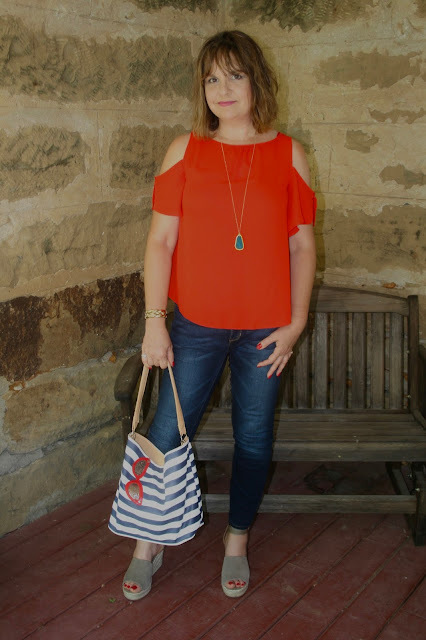 In my last post where I featured a cut out top, I talked all about how to wear this trend if you don't like to expose your shoulders. That was a very popular post, so I'm assuming a lot of women other than myself have the same issues with this style of top. The top I wore in my first post was cut out mainly in the outer arm so the shoulders were covered. 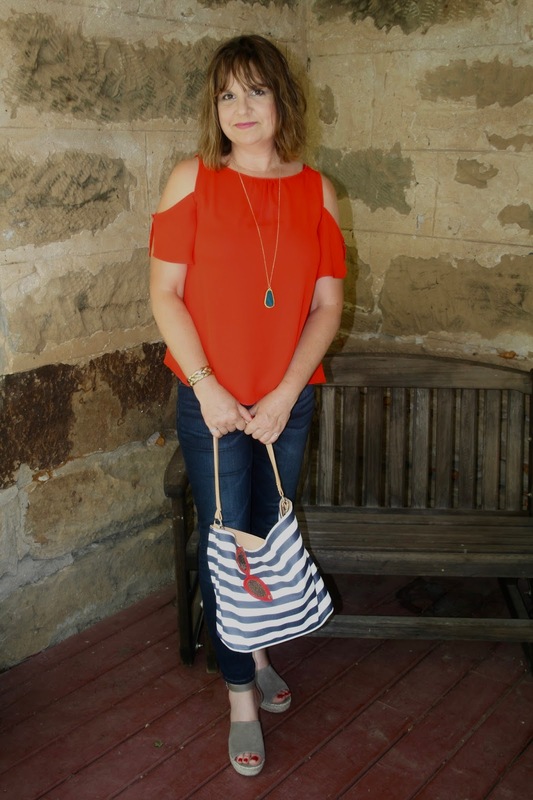 The top I'm wearing in today's post the shoulders are completely exposed, yet the fullest part of my arm is still covered; which is a win-win for me. I also like that it has a high neckline so my chest is fully covered as well. The top is by Worthington and is sold at JCPenney. It has a round neck and is slightly gathered at the neckline with a keyhole opening in the back. The sleeves also have a split opening. I wore a strapless bra with my top, but I think because the material is wider on the tank portion of the top you might be able to get away with a regular bra if you position the straps just right. 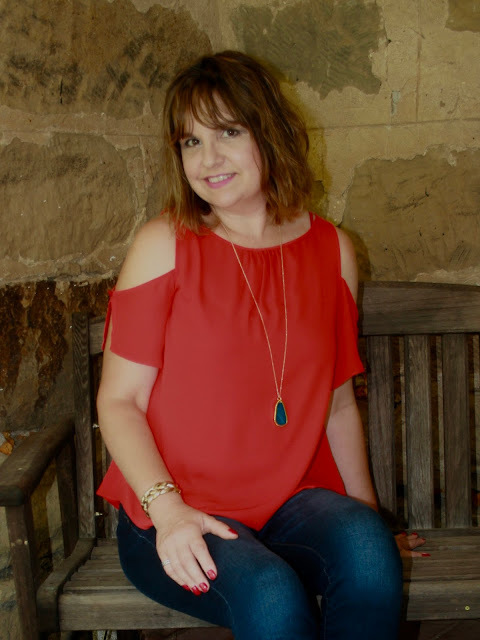 This top is a little sheer, so I wore a red camisole underneath. 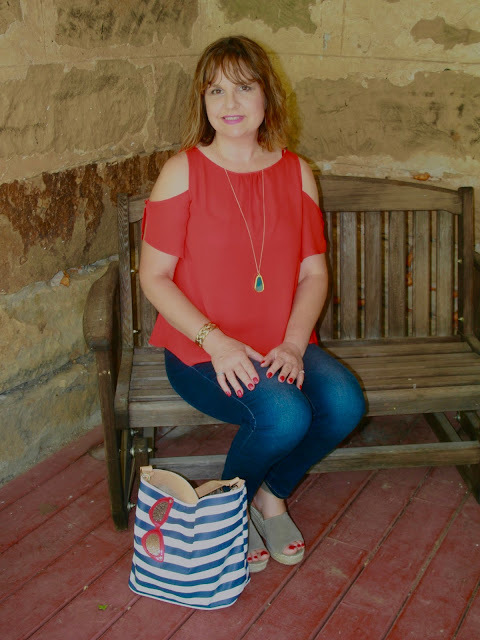 I styled my top with Liz Claiborne skinny jeans, Steve Madden wedges, and a blue and white striped handbag. I accessorized with gold jewelry. The necklace is an emerald green stone. I wore this outfit to church, out-to-lunch, and shopping. The top stayed wrinkle free all day! The only negative thing I can say about this top is that I had this constant annoying feeling that my bra straps were slipping off my shoulder. But of course it wasn't my bra straps, because I had a strapless bra on...it was the the sleeve that was giving me that feeling. How funny! You all know I don't like clingy tops. This one is nice and loose in the tummy area. It is very cool and comfortable to wear. So what about you? Have you purchased any cut out tops this season? I'd love to hear from you! I love this outfit! I think the top looks really nice on you and gorgeous color. The necklace fits perfectly too! I bought a couple of these shirts this season. Hopefully they'll stay in style for a bit, but you know what...I probably would still wear them, because I like how they look, and as long as I like how something looks on me, I don't mind wearing those items even if they are out of style. Thanks so much Elli! I have a hunch they'll be around next year too! I do love these cold shoulder tops, but only because I can wear a bra with them. So I'm wondering why you wore a strapless with it, Amy? It seems like it would cover them okay?? I have a strapless, but I just don't love them as much....maybe I need a new one?? This color is fabulous on you too!! I need a little more orange in my life! Thanks Jodie! I wore a strapless bra because my bra straps kept peeking out under the narrow strap. Love the outfit and the flame colour. You're looking so pretty, as always. I bought two and we're about to enter a two week run of sun so they're going to start earning their keep! Aww, thanks so much! I can't wait to see you cut out tops! Nope. It's the same haircut I've had for a couple of years now. I think it's just slightly straighter than I normally wear it. Thanks so much! You look gorgeous in that color! 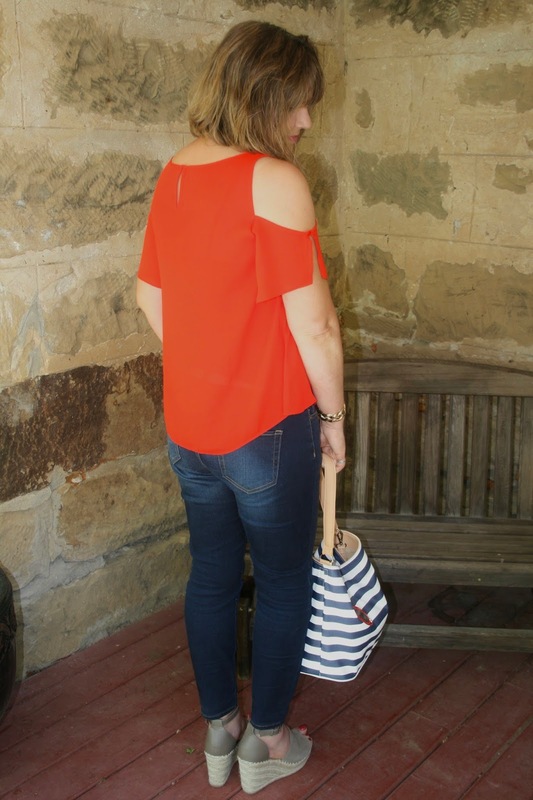 I love the cold shoulder top and the little slit details on the shoulders! You look great in that outfit! Thanks for linking up to Top of the World Style. I love this style of top, and the bright orange shade is fab. The long necklace is perfect with it. Thanks for linking up! 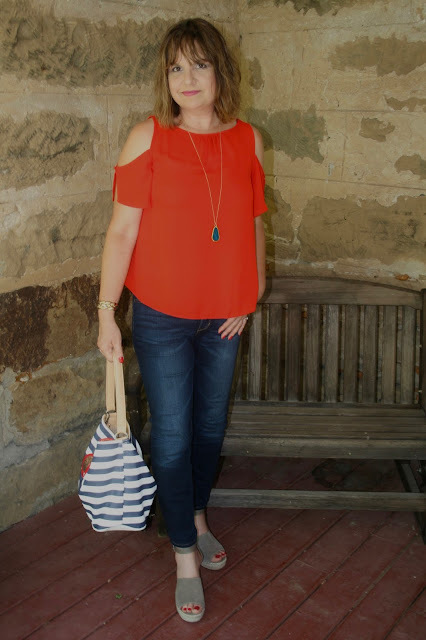 I love the cold shoulder trend and that top is darling! Love the bright color! Your bag is the perfect accessory for this summer look!